Boy does this game put you through the ringer, not only in how it demands a non-stop stream of decisions to be made by you (and often in timed, pressurised environments, too), but also in how it constantly tweaks, prods and challenges at your programmed gamer instincts and habits. Consistently and inconclusively morally grey in a way that modern video games typically never allow, Detroit fights against its few flaws to emerge as one of the most interesting and emotionally resonant video game experiences of the year. I've been following the development of Detroit: Become Human for years now, with T3 last reporting on the game at the Tokyo Game Show last year. And, if I am honest, it really has felt like a long time coming - something almost certainly down to the fact that the title has been delayed multiple times during development. The other reason I've been waiting for Detroit to drop is that its maker, Quantic Dream, has a storied history of creating ambitious, challenging and unique games that put player choice and narrative at the fore, and to an extent that is not replicated elsewhere. This has made titles like Heavy Rain and Beyond Two Souls, despite their flaws, unique propositions in the gaming industry and, well, uniqueness is in short supply these days, no. And, I'm please to say that the wait has, on the whole, definitely been worth the wait. Quantic Dream has really taken its established interactive, multi-path formula to new heights with Detroit: Become Human, and in partnership with some quality writing, acting, and motion capture, as well as some engine-defying visuals, produces a title that offers a unique, engaging and - in the main - enjoyable gaming experience. Almost inevitably Detroit isn't perfect, but as we will see, this doesn't stop it from being one of 2018's most interesting and refreshing titles. Read on for T3's full Detroit: Become Human review. To get an idea of how the game plays before we get into the meat of T3's Detroit: Become Human review, you should watch this short gameplay video which runs through one of the game's earlier scenes, showing you how it works and how you as the player are tasked with interacting in it to decide its course and conclusion. Detroit: Become Human is available on May 25th, 2018, from a wide-variety of retailers including Amazon, Game, Argos, and the PlayStation Store, among others. There are various editions of Detroit: Become Human, including the standard game, a Digital Deluxe Edition, and a Japan-exclusive special edition. Detroit: Become Human in standard edition form retails for £49.99 at launch. Detroit: Become Human is set in a future version of Detroit that, thanks to the invention and then proliferation of androids, has been markedly improved and turned around in terms of economic prosperity. The wide spread and normalisation of androids as useful tools throughout society, both in Detroit and further afield, has led to their adoption into every aspect of life, from manual labour, to au pairs, through to shop assistants, adult trade workers and, in the case of one of the game's playable protagonists, a detective. Despite these differing roles, the common thread that connects all of the game's androids, however, is their subservient status in society, with the machines specifically programmed to to serve and obey. The game's protagonists, which you would think only natural for a game about androids, are three different androids positioned in three different areas of society. Kara is an android in a domestic service role in a poor, working class neighbourhood, Markus is an personal assistant to a wealthy, famous, and infirm painter, and Connor (who is the most advanced model of android yet to be created) is akin to a blade runner, hunting down defective androids. And this player agency, acting on behalf of the androids, controlling how they act and behave, directly feeds into Detroit's main feature and strength, a plot that can radically alter depending on what choices are made. As such, while there is a general overall plot in Detroit: Become Human, how it plays out, how characters get on, and how it concludes can vary dramatically. The roles the game tasks the gamer with playing are undertaken in a wide-variety of locations across the city of Detroit and its surrounding environs. And, without giving too much away, through some restrictive but very detailed environments (Detroit: Become Human is very much not an open world game), these help realise the world the player operates in effectively, communicating its wider feel and tone in a subtle and realistic manner. Indeed, Detroit makes slipping into your role and then playing your part as you see fit very easy. Scanning rooms, objects and people, often while finding clues, is a key game mechanic in Detroit: Become Human. And, speaking of the roles you undertake in Detroit while playing the game, they involve three main gameplay mechanics. With an over the shoulder camera angle, the first of these is to play out the game's story by successfully navigating your character through its environments. This is achieved with the traditional left analogue stick of choice, which let's you walk or run (the game decides) around the game world so that you can talk to people, or accomplish plot-moving tasks in a way you see fit. Unfortunately, how the characters move within the game world is one of the less-than-ideal areas of Detroit: Become Human, with them controlling very stiffly when out of a QTE event. During my review period I would find myself getting snagged on the environment occasionally, too, or needing to slowly turn around and re-approach an interaction point for a command to register. These were quite infrequent, however, this and the stiff control did break immersion, which is very much what this game is going for. An example of one of the game's various gesture controls. Identifying interactable people, objects or parts in the environment is aided in all characters by a "Mind Palace" scanning mode. This works in a similar way to scanning modes you've probably experienced in other games, such as The Witcher 3 and Batman: Arkham Knight, whereby you hold down the R2 button on the DualShock 4 gamepad and then time slows to a crawl and things of note get highlighted. Once you've identified these things, you can then interact with them, bringing into play the other two core mechanics in Detroit: Become Human. The first of these is manipulating and interacting with objects via quick time events (QTEs) utilising the gamepad. The scope and breadth of these inputs are quite varied, ranging from flicking and rotating joysticks, to pressing buttons, rotating the pad entirely or lowering or rising it, swiping on the central touchpad, or even holding down a variety of buttons at the same time.The first of these is manipulating and interacting with objects via quick time events (QTEs) utilising the gamepad. The scope and breadth of these inputs are quite varied, ranging from flicking and rotating joysticks, to pressing buttons, rotating the pad entirely or lowering or rising it, swiping on the central touchpad, or even holding down a variety of buttons at the same time. These commands vary in complexity and timing. Some are simple one action events that have no time restraint while others, especially in the game's various high pressure flashpoints, are very complex and fast, requiring the user to input a series of commands in a short period of time. And, as the game, has an absolute myriad of possible outcomes, how you perform in these events often has a direct effect on the course your story takes. The final key game mechanic in Detroit: Become Human is speaking to people and other androids, with a selection of possible responses available in each and every encounter. What conversation options are available to you depends on your past actions, as well as character's relationships to you, which can either augment possibilities or remove them. 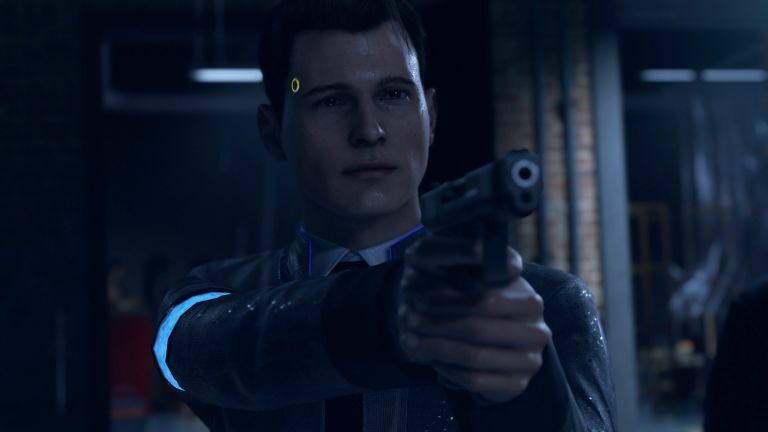 For example, when playing Connor if the gamer finds certain pieces of evidence when investigating his case, then that will unlock dialogue options with certain characters. Equally, when playing as Markus, for example, if I unwillingly or not act in a way that causes a character a bad experience, then that will downgrade how they feel about him, potentially reducing or altering potential dialogue options. Exploration can pay dividends when playing Detroit: Become Human. And, while certain of these dialogue choices and actions have more clearly sign-posted outcomes, the great strength in Detroit: Become Human is that many do not, and often you will never find out how they effected the story (if you do at all) until you finish each scene, which very much act like the game's levels. At the culmination of each scene you are presented with a flow-chart that details every single choice you made while playing through it, as well as showing potential other options (although these are blanked out until you've realised them in another play through).At the culmination of each scene you are presented with a flow-chart that details every single choice you made while playing through it, as well as showing potential other options (although these are blanked out until you've realised them in another play through). The result of these core gameplay mechanics lead to an experience akin to performing in an interactive movie, with the player strictly carried along within a set story framework, but given freedom within that to act as they desire. As a gamer who very much enjoys these sort of tailored, story-focused experiences, I got on very well on the whole with how Detroit: Become Human plays, however, if you are a gamer who usually spends a lot of time in open world games, then I definitely think there will be a period of acclimatisation for you. Straight of the bat I am pleased to say that Detroit: Become Human is pretty game. The game's character models, which are synced with motion-capture from real actors, are right up there with the best I've ever seen in a video game. Quantic Dream has great experience in mo-cap and it shows here, with characters both human and android alike looking and moving (within set scenes) incredibly well. Detail on objects, buildings, and environments in terms of texture work is also really strong and, as mentioned above, this big detail pays off in helping to create a believable stage for the game's various scenes to play out. Lighting, too, seemed to have had a lot of time put into it. Texture detail and lighting are some of the graphical highlights of Detroit: Become Human. Where the game doesn't look so good in my mind is in terms of how last-gen blocky the surrounding world engine is. On the whole I think Quantic Dream has done a good job in hiding this, but every now and then something really stands out, I noticed trees and vehicles in particular didn't look very good, and again these moments led to small immersion breaks. Overall, though, Detroit: Become Human ran incredible well on my PS4 Pro and I thought the art style did justice to the world the game creates. Lastly, Detroit: Become Human features a very strong musical score. This score was composed by three different composers respectively, one for each character, and without going into too much detail, I can confirm that it subtly evokes the emotional resonance of the scenes playing out in the game. This combined with the game's aforementioned strong voice acting combines to create a superb sonic package. The idea that a video game is confident enough to eschew the rush to open world conformity that arguably plagues the industry at the moment to instead deliver an expansive and complex on the rails experience that isn't afraid to pitch at and attempt to explore adult themes is awesome. And, on the whole, I'd say that Detroit: Become Human delivers on that aim. Good actors deliver a generally well-written script and you, playing the part of androids Kara, Connor and Markus, play your part how you see fit in a series of scenes both mundane and dramatic, with dialogue choices and QTE set pieces propelling things forward. The character modelling and motion-capture work looks great, too, and really helps you forget how blocky the surrounding environment can look and how tank-like the characters can control, while the musical score (put together by three separate composers no less) flows well between narratives and impresses on the ear, building tension, conveying emotion, or defining an action or character as needed. And the decisions the game asks you to make, the all so important moments that define how the story of Detroit: Become Human plays out, are often grittily realistic and complex, with no right or wrong option available, and often not even a definite or knowable outcome. Many times you will make decisions and not even be aware of the impact you have made until it is too late and you are looking at the end of level flow-chart, and that's if you find out at all. Not every choice you make matters in Detroit: Become Human, but you'll never know which does or does not, and often what your gamer gut will tell you to do, how video games have subtly programmed you to act when playing them, will be bang wrong in this game. At times this left me feeling angry and frustrated with a perceived less than optimal conclusion to certain interactions, but then again that's kind of how life works, right? You act and, even with the best intentions, the effect you cause can often be far from what you intended and the outcome for you and others un-ideal. It is part of being human and thinking like one, which is very much the ideological core that Detroit: Become Human explores with cinematic style and, for the video game industry, refreshingly mature execution. For more information about Detroit: Become Human then head on over to the game's official website.